Like so many of Car Spitzweg’s paintings, The Bookworm takes a humorous look at the world around him. The target this time is a scholar in a rather large library. High up on a ladder, in the Metatphysik (Metaphysics) section, our scholar is definitely not being portrayed in a favorable light. In his attempt to understand the world, he apparently escapes to a lonely corner of a library filled literally floor-to-ceiling with books. Natural light from an unseen window or skylight shines down on our scholar as he looks in what Spitzweg may be trying to tell us is the wrong place for the knowledge that the scholar seeks. Painted in 1850, just two years after the European Revolutions of 1848 that were considered the first, and only, Europe-wide collapse of traditional authority, Spitzweg depicts what at first glance is a quiet moment that upon further study contains its own elements of instability and untidiness. 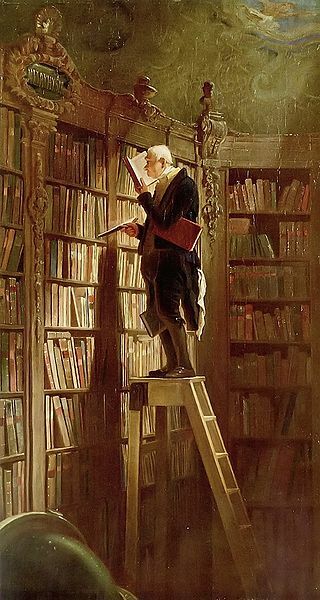 With books in both hands, under his arm and even between his knees our unknown scholar shows a preoccupation with his search for knowledge with a bit of disregard for his own safety. His handkerchief dangles by a small corner from his pocket and the proximity of the book to his face might indicate glasses left behind somewhere below. The article in Wikipedia takes the conversation further by making assumptions about the faded globe in concert with the time period when Spitzweg painted The Bookworm. Whether or not the globe and its lack of readability indicates a lack of interest in the outside world by our scholar or the globe is simply something that would have normally been present in a library of this scale is left to the viewer to decide. But, I suspect the author may have been on the right track considering that Spitzweg made it clear what subject was being studied. Unfortunately, as much as Carl Spitzweg and his art are loved by the people of Germany and the world, very little is known about his personal life. What I was able to find, I’ve compiled into a profile of Carl Spitzweg where I’ve also included several of his other famous paintings. The Bookworm is a somewhat small oil on canvas painting which measures only 19.5 inches by 10.5 inches. It resides in the Museum Georg Schäfer in Schweinfurt, Germany. Stephen Farthing included The Bookworm” in his 2007 book One Thousand One Paintings You Must See Before You Die.